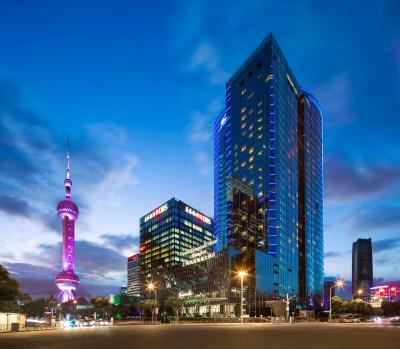 Lock in a great price for Grand Kempinski Hotel Shanghai – rated 8.6 by recent guests! Extra convenient location,750 meters walk to line 2 metro.Beautiful hotel,really nice and clean room,extra comfortable bed.Delicious breakfast but didn’t change much from day to day and after 3 days became a little boring.Quick check in and out. I would definitely recommend this place to my friends.Absolutely loved it!! 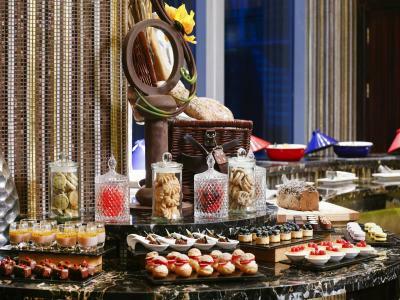 Its OK and a Normal Breakfast that a 5 Star Hotel as Kempinski may serve. Everything was clean and beautifully decorated. Room was spacious and luxurious. Beds were very comfortable. The location was central to everything. Staff very responsive. Front desk staff is very doing the job, not very flexible. But the hotel room staff is very good and friendly. All about the location of the Hotel was fabulous and refreshing location. 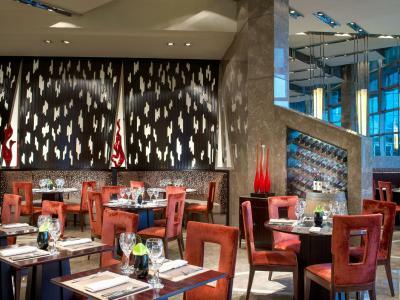 dining are nice with options and the stuff behaviours are very cordial. Amazing hotel. We loved everything about it. 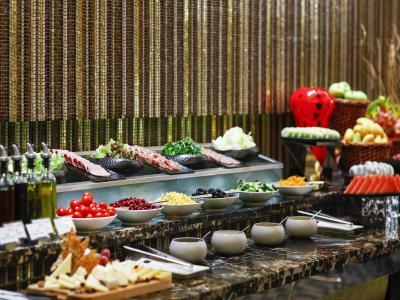 Don’t miss the spectacular food at the hotel’s Chinese restaurant!!! Grand Kempinski Shanghai shown to be the best choice we could have made for our very short business trip. 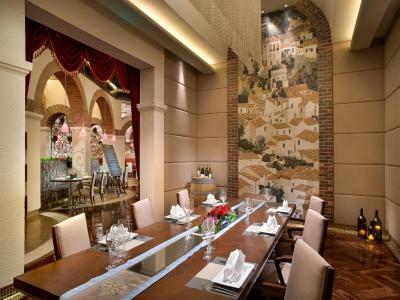 Besides great hotel staff and food experience (Italian restaurant on 2nd floor was just amazing!) what made the overall trip and experience even better was being on walking distance from tunnel cable car, IFC and super brand shopping centers, world congress centre, river side walking-jogging-cycling route. 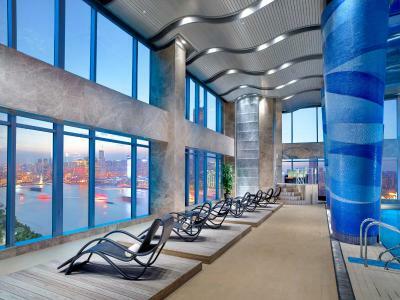 One of our top picks in Shanghai.This luxurious Grand Kempinski Hotel Shanghai in Lujiazui Financial Area features a penthouse indoor pool, 7 dining options and a pampering spa. 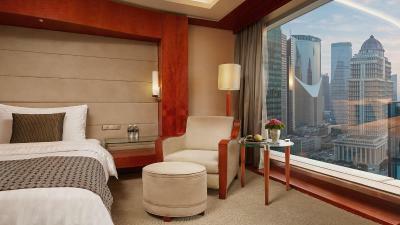 Beautiful rooms feature views of Pudong financial district and the Huangpu River. 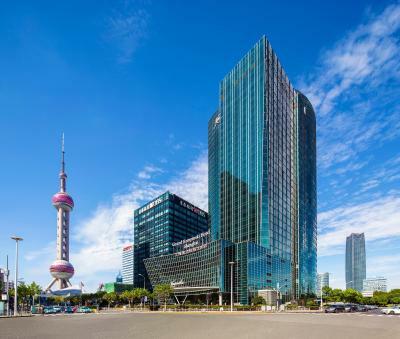 Surrounded by several popular attractions including Oriental Pearl Tower, Jin Mao Tower and Binjiang Park, Grand Kempinski Hotel Shanghai is a convenient 3-minute walk from Lujiazui Metro Station (Line 2). 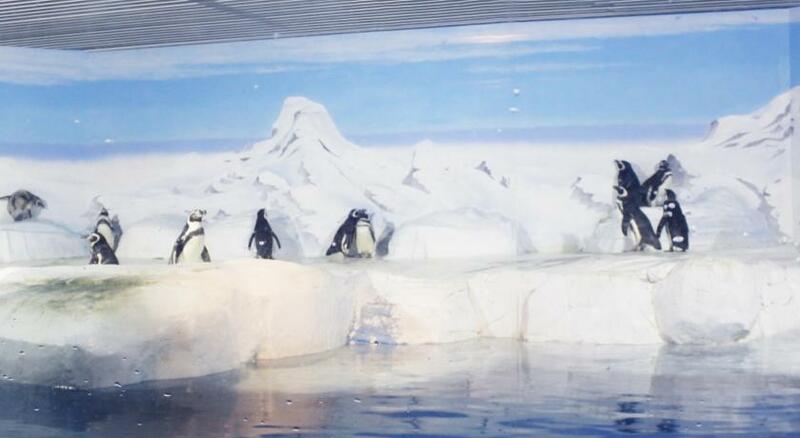 It is a 15-minute drive from Shanghai New International Expo Center. Hongqiao International Airport is 11 mi away, while Pudong International Airport is 25 mi away. Shanghai Disneyland can be reached in 42 minutes by car. 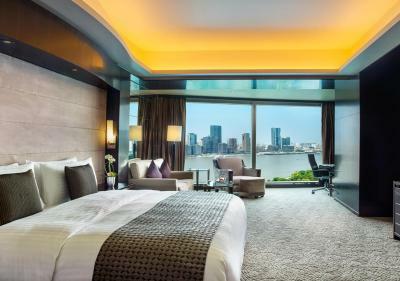 Offering either city views or Bund views, the spacious air-conditioned guestrooms at Grand Kempinski Hotel Shanghai feature stylish Art-Deco design and a large marble bathroom. Each room offers a flat-screen TV, iPod dock, 2 bathrobes and mini-bar. The Yhi Spa offers a wide variety of massage treatments, as well as sauna rooms and spa baths. 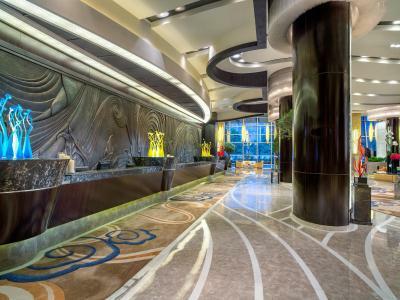 Guests can also exercise at the well-equipped fitness center or arrange day trips at the tour desk. 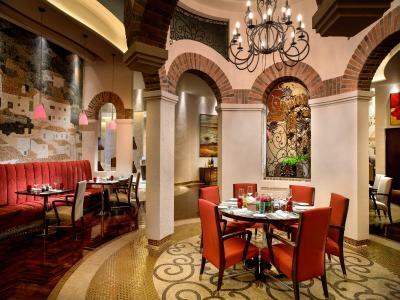 International, Spanish, Chinese and Italian cuisines can be enjoyed at the hotel's on-site restaurants. 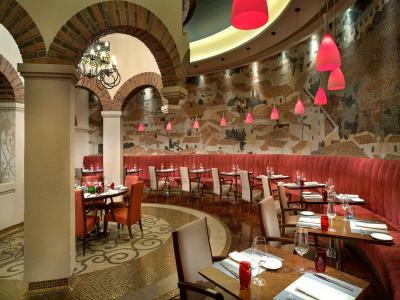 Other dining options include 2 bars, a tea shop and a cigar lounge. 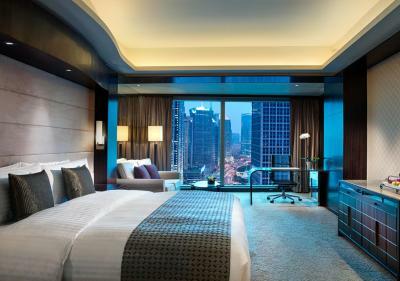 When would you like to stay at Grand Kempinski Hotel Shanghai? 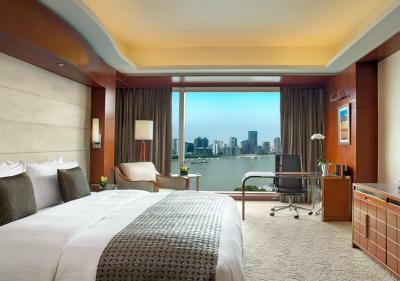 These large Art-Deco rooms feature large windows with views of the beautiful Huangpu River and include an iPod docking station and 2 bathrobes. The spacious marble bathroom has a walk-in shower and separate bathtub. 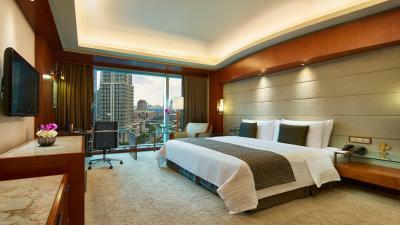 Large room features large windows with views of Pudong. Offers an iPod docking station and 2 bathrobes. Spacious marble bathroom has a walk-in shower and a separate bathtub. 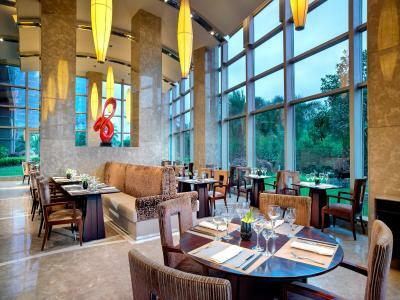 Large room features large windows with views of the beautiful Huangpu River. Offers an iPod docking station and 2 bathrobes. Spacious marble bathroom has a walk-in shower and a separate bathtub. 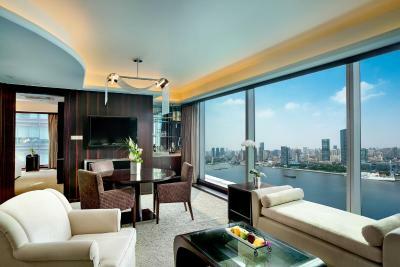 Spacious suite comes with a separate living room, views of the Bund and floor-to-ceiling windows. Offers an iPod docking station and 2 bathrobes. The suite features a king-sized bed and a separate living room. Offers an iPod docking station and 2 bathrobes. This twin/double room has a satellite TV, iPod dock and bathrobe. This apartment has a electric kettle, kitchenware and oven. 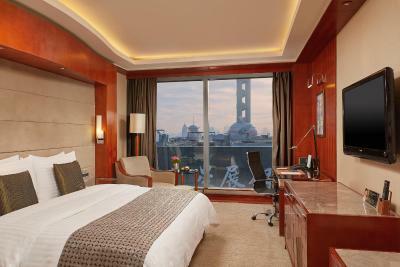 Welcome to the Grand Kempinski Hotel Shanghai, situated in the heart of Shanghai’s financial district Lujiazui. Offering stunning views of the city’s glittering skyline, the hotel is perfectly located for both leisure and business visitors. 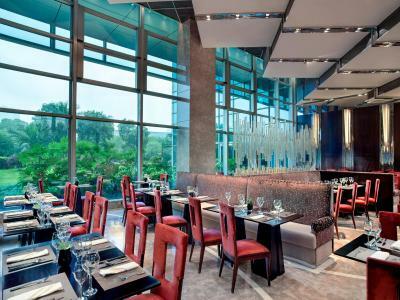 Guests can choose from a range of luxury rooms and suites to suit their requirements and the hotel also provides four gourmet restaurants and three bars with incredible views of the city. There is an onsite health club which includes a spa, swimming pool and gym, and the city’s visitor attractions and shopping malls are also easily accessible from the hotel. 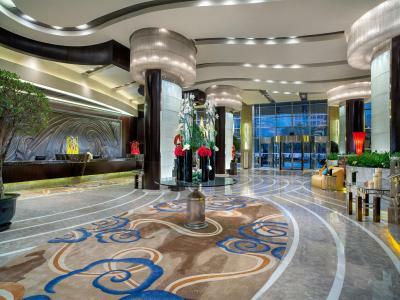 At the heart of Asia’s financial centre, overlooking the Huangpu River, the hotel offers endless opportunities for business travellers. If you are visiting for leisure, the hotel’s location is ideal, offering easy access to the city’s major landmarks and tourist attractions. 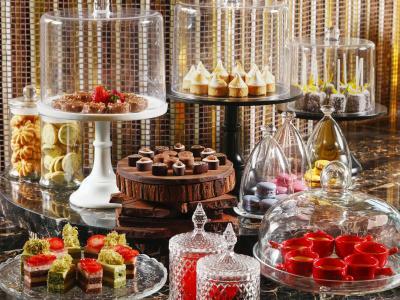 House Rules Grand Kempinski Hotel Shanghai takes special requests – add in the next step! Any additional older children or adults are charged CNY 350 per night for extra beds. 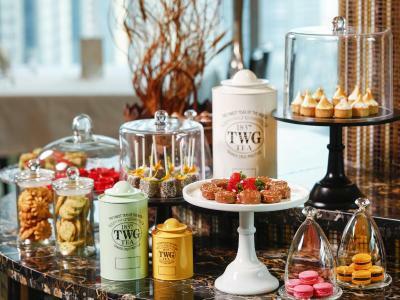 Greatwall Peony Dragon Pacific Grand Kempinski Hotel Shanghai accepts these cards and reserves the right to temporarily hold an amount prior to arrival. Grand Kempinski Hotel Shanghai accepts these cards and reserves the right to temporarily hold an amount prior to arrival. 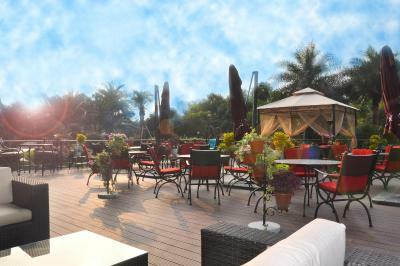 Please note that credit card information is required to guarantee the reservation. Please inform hotel before 18:00 of arrival date for request of cancellation and date modification. Guests are required to wear a swimming cap while swimming. Children between 0-5 enjoy free breakfast and children between 6-12 enjoy breakfast at half price. When we shower water runs out from the glass door onto the bath room floor all the time. Beds are good. One thing is worse, some people are travelling with their air pressure machine and we don’t find any electric sucker for appliance use. Most inconvenient. This undermine the rest of the good quality of the room. Better take note. Location is excellent, next to the Tower and 500m to the metro station. Room is clean and facilities are good, the gym is well equipped and has a nice night view. Staff are friendly and helpful. Too Unorganized handling at the entrance of the Breakfast Restaurant and the staff needs to be more organised to handle the guests. Such long waiting is very abnormal and have never seen like this anywhere. 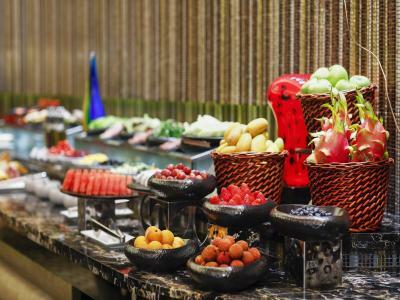 Very good breakfast with vast variety of meals. However around 10 it is crowdy. Swimming pool and jacuzzi with great view to the Bund. Helpful and friendly staff. Most of them speaking English. Internet is very bad and only 5Mb is free. If you want more or faster you have to pay for it. Modern hotel. Great staff. Excellent location. Big and clean room. House keeping fast respon. I was hesitating to write a feedback about this hotel on booking.com. Because as more popular it gets, as more difficult it may be in the future to get a room there... however, as this hotel is serving on a TOP level, it would be unfair not to do it. 1) staff is not only very friendly but will help to solve all issues/questions you may have during your stay 2) facilities: top 3) food offerings: top (try the italian/spanish restaurant if you can) 4) rooms are very clean and spacious. 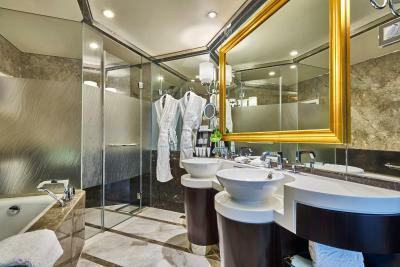 spot on towels and free wifi (if you are registered as a Kempinski member) 5) location: right in downtown - office/financial district. taxis are easy to get if you ask the concierge or use Chinese Taxi apps. all taxi drivers know the hotel and will find it quickly. 6) not the cheapest one - but clearly worth the money. All prices are reasonable 7) as this hotel honors frequent customers - it makes sense to regularly visit if (forget about the other common chain hotels in Shanghai) honestly, I have slept in dozens of hotels in Shanghai over the years. this one is clearly on top of my list. Not much happening in surrounding area, need to get a taxi to bars and livelier areas. Executive lounge very nice and happy hour was more cost effective than drinking in bar, so paid for it's self.